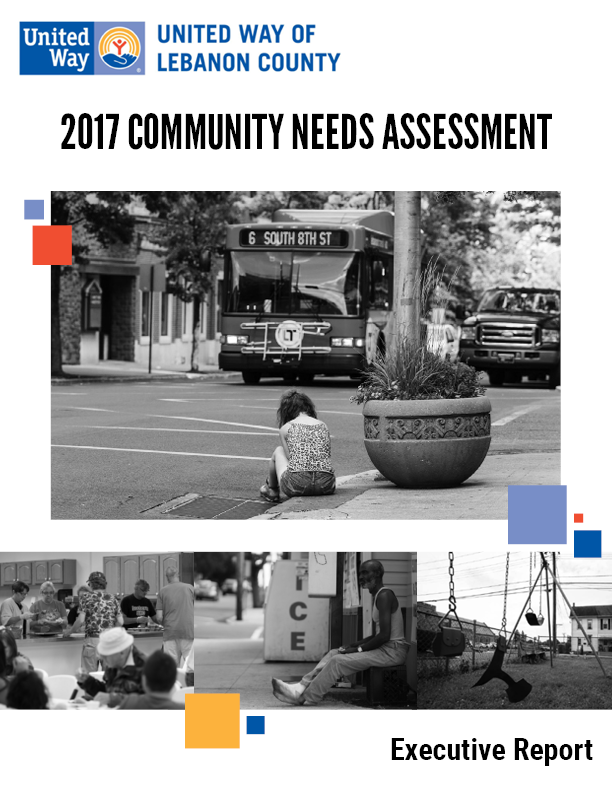 The 2017 Community Needs Assessment identifies major needs in the community through survey data, secondary data, and focus groups. With the help of Penn State Harrisburg's Institute of State and Regional Affairs, United Way of Lebanon County conducted a community-wide Community Needs Assessment in the spring and summer of 2017. The goal of this initiative was to understand the demographic makeup, unmet needs, utilization of services, and barriers to receiving services for those living in Lebanon County. The research team completed four major elements as part of the community needs assessment: secondary data analysis, focus groups, a community survey, and a Community Conversation. This project culminated in an Executive Summary Report, which was released in the fall of 2017. Click here to read or download the full Community Needs Assessment Executive Report. This project was made possible by the dedication of many individuals from Penn State Harrisburg and United Way of Lebanon County. The project team from the Institute of State and Regional Affairs at Penn State Harrisburg included Stephanie L. Wehnau, Nicole Sturges, Tim Servinsky, Sue Copella, Jennifer Shultz, Larry Meyers, and Tim Schock. United Way of Lebanon County's advisory group members included Colleen Christian, Oneida DeLuca, Phil Domencic, Doug Etter, Carolyn Haskell, Bob Hoffman, Terri Smith, Jennifer Snyder, Phil Tipton, Melanie Wells, Troy Williams, and Maureen Zimmerman.